Shenmue III is a game many thought would never see the light of day; a costly casualty of Sega’s exit from the console business. At E3 2015, Yu Suzuki blew our minds by announcing the game we’d been waiting for. Kickstarter records were shattered, and the rest is history. That’s all good, but why should you care? This post contains spoilers for Shenmue I and II. Whether you loved or hated the original Shenmue games, it’s hard to deny their significance. Shenmue is essentially the granddaddy of all the open-world games you’ve loved over the years; it was one of the first games to feature realistic weather cycles, which were actually patterned off those present in Yokosuka, Japan during the time period in which it takes place. It was also among the first games to have a truly open world you could explore, filled with diversions and a level of realism that up to that point had not yet been seen in games. Shenmue’s influence can be found in games like GTA and Yakuza, to name just a couple. God of War made use of QTEs more than most of us probably would have liked, too. It’s doubtful that Shenmue III will innovate in the same way the original did, but for all the mechanics and systems those games introduced, the main reason that Shenmue matters, especially to its fans, is the story. If you played Shenmue I and II, you’re probably both excited and frustrated. At the beginning of the original Shenmue, Lan Di shows up at the Hazuki dojo and murders Iwao, Ryo’s father. Over the course of the game, Ryo investigates the circumstances surrounding his father’s death in his hometown of Yokosuka, only to find Iwao’s murderer has fled to Hong Kong. The game ends with Ryo on a boat to continue his chase. In Shenmue II, however, things take a hard left turn. Ryo doesn’t get to confront Lan Di, but instead watches him flee in a helicopter after fighting his way through Hong Kong’s underworld of seedy gangsters and underground fighting rings. It looks like the game is set to end there, but instead Ryo gets a lead on Lan Di’s location and follows it to a remote village in China. There, he meets a girl named Shenhua who guides him to her home and you play through a series of mundane tasks with her. Shenhua’s father disappears, and that’s where Shenmue II’s true ending begins. Ryo and Shenhua travel to the mine her father works at, and discover it has been abandoned. After doing some exploring they find, of all things, a sword hanging out in there. Things escalate, and Ryo is read a prophecy about traveling across the seas to find this sword, which is now hovering in mid-air. Up to this point, everything in Shenmue has been at least somewhat grounded in reality; no super powers, no fanciful weapons. Directly after this, the screen fades to black and the words “The story continues....” appear. In the final minutes of Shenmue II, Yu Suzuki and company changed all the established rules of the game’s universe and left us on a cliffhanger. It’s the ultimate kind of torture, and for the fans like yours truly, the opportunity to find out what happens next is almost better now than it was 15 years ago. The resurrection of Shenmue is almost a damn miracle. A long-dead franchise from a nearly irrelevant company coming back with its original creator at the helm is the kind of stuff that just doesn’t happen, or at least it didn’t happen until last year. Look close enough at this GIF and you’ll see me in it. 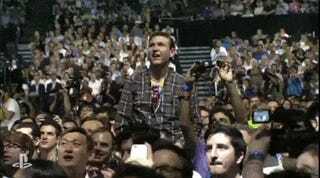 When Yu Suzuki took the stage at E3, I screamed, hollered and cheered. I’m not ashamed to admit it: I cried. Like many fans, I had been waiting on the continuation of Ryo’s journey for 15 long years. I had given up any hope of finding out what would happen years ago. To find out it was actually happening was enough to push me over the edge. E3 could have ended on that note and I would have been happy. As soon as Sony’s E3 press conference ended, fellow TAYer Jose ‘Nach’ Acosta and I rushed out and I threw as much money as I could reasonably afford at Shenmue III’s Kickstarter. I gave them 300 dollars, and was hoping to shake more out of my empty coffers. Many of my Shenmue-loving friends did the same that day. Some of my friends that didn’t even care much for the franchise sent a few dollars out knowing how much it meant to me that the game be funded. We all know how that played out: Kickstarter records were broken, the game was funded and all was right in the world. Perhaps that’s the reason Shenmue III matters. It sent a loud, clear message to developers and publishers: never lose faith in your games. People do love them, and even if you’ve given up on them, the fans haven’t. And to the players, never give up hope. After years upon years of waiting, hoping, pleading and begging, mail-in campaigns, tweetathons and offers to crowdfund, the message got across. It took 15 long years, but without fan outcry, it might have never come to pass. 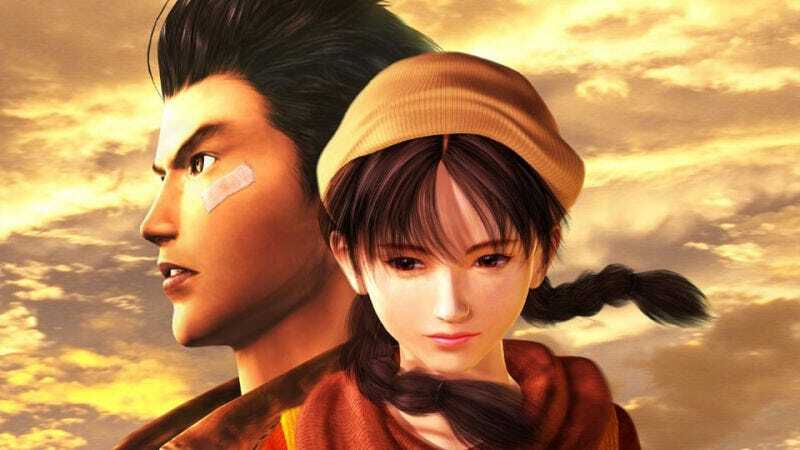 Shenmue III owes its existence to the fans that never stopped supporting it. When I wrote my first public request for Shenmue III a little over five years ago, I never thought I’d be writing an article proclaiming our success, but here we are. Publishers, take heed. If you support your games, your fans will support you. When Steve isn’t waiting decades for sequels he writes about games and other things that pique his interest, you can follow him on Twitter at @SteveBTAY or read the rest of his stuff here.